Faith Lutheran Church has a long history in Wabasha, MN and has prospered and grown ever since 1968. They continue to offer weekly worship services, bible study, youth ministries, several community offerings and so much more. 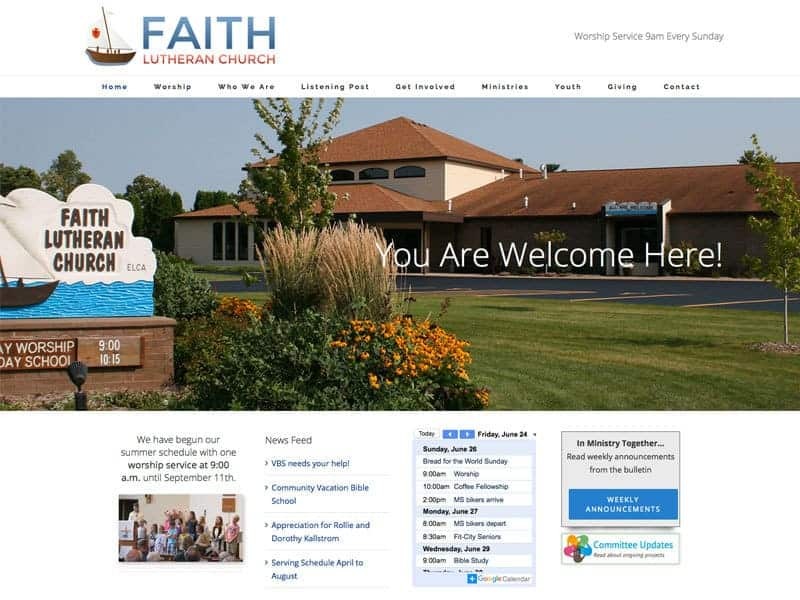 Adapting all along the way, Faith Lutheran Church was ready for a new website to share its mission and offerings. “You are Welcome Here.” An updated and mobile friendly design now better communicates Faith Lutheran’s philosophy of welcoming all visitors. Vision Design helped develop a well structured menu and easy navigation to keep their extensive list of information organized and at your fingertips. The site also features a calendar of events, videos of weekly services, and a signup form for their newsletter. The addition of a blog now shares the latest happenings at the church, keeping everyone informed! Plus readers can now leave comments for feedback. And best of all, with the new site, staff can easily make changes and updates to the site as needed. Ready to update your look? Let Vision Design help get your site freshened up and working harder for you. Contact us for more information!